All you need to know about buy-to-let property investment in the UK, from market and corporate news to the new upcoming developments. Which London boroughs are predicted to have the best prices growth up to 2020? How does Liverpool's growing student population affects the property prices? Find out answers to these questions and more from the leading UK property investment consultancy. 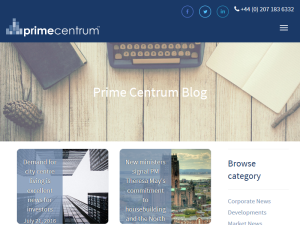 This what your Prime Centrum Property Investment Blog Ad will look like to visitors! Of course you will want to use keywords and ad targeting to get the most out of your ad campaign! So purchase an ad space today before there all gone! The Liverpool city region’s visitor economy is now worth more than £4.5bn, supports 53,500 jobs and last year welcomed 64m visitors, its Local Enterprise Partnership has said. The visitor economy has grown yet further in importance to Liverpool in the years since the 2008 Capital of Culture year and continues to drive development in the city – the £50m cruise liner terminal, started in May, is a banner project, while Lime Street station is undergoing a £340m redevelopment. In the private sector, hotels and serviced apartments have constantly appeared among the monthly planning agendas. Elliot Group will open the Seel Street Hotel by Epic in November, by which time it is expected to make a start with a 306-bedroom hotel in the Baltic district in October. Wates is to build a 200-bedroom hotel close to the cruise terminal, while Accor has paid £20m to acquire the Novotel on the edge of Liverpool ONE. The region welcomed more than 64.2m visitors – a 2.7% increase. This comprised of 59m day visitors, up 2.8%, and 5.3m staying visitors, up 2.6% on the previous year. Those staying in paid accommodation rose by 3.6% to 2.6m – the economic impact from this alone rising by 8.9% to £950m. Consequently, the region has enjoyed increased employment in the sector – over 53,500 jobs, an increase of 3.5%. A 1.9% increase in visitor numbers – up to 35.4m. A 2.2% increase in the number of staying visitors to 2.6m, including a 2.1% increase in serviced accommodation days. The wider benefit of this growth is the 3.2% rise in jobs – to almost 35,000 in Liverpool. The economic impact in Liverpool is now £3.02bn – a rise of 5.6% in the last year. The figures are put together using the STEAM – Scarborough Tourism Economic Activity Model – process, commonly used in the tourism industry to measure economic impact of visitor economies, along with International Passenger Survey information. The results are calculated using a range of tourism inputs including hotel occupancy, transport figures, attractions attendance figures and event figures. Long-term trends show that from 2009 to 2017, there has been 66% growth in the economic value of the visitor economy to the Liverpool city region, rising from £2.73bn to £4.53bn – averaging out at 6.5% per year. Visitor numbers have climbed from 52.3m in 2009 to 64.2m in 2017. Placed in a wider context, Visit Britain’s annual summary showed an increase of 4.3% in inbound tourism visits in 2017. Although the Liverpool city region’s growth was only 3%, the number of days that visitors stayed climbed 3%, against a UK average that saw a decline of 1.3%. The LEP said that factors helping Liverpool’s performance included Liverpool John Lennon Aiport, which continued its steady rise in passenger numbers since being re-acquired by Peel in 2014. LJLA recorded 4.95m passengers, a 3% increase that represented its highest total since 2011. Key events in the city included the Open Golf Championship, held at Royal Birkdale in Sefton, and the River Festival. Although not cited by the LEP, the expansion of Anfield, which has added around 8,000 seats to Liverpool FC’s stadium, has added further to the club’s ability to satisfy a global fanbase..
Peter Sandman, head of visitor economy for the LEP, said: “In the ten years since Liverpool became European Capital of Culture, the city, and region as a whole has seen the visitor economy experience a healthy growth and the sector continues to contribute significantly to the region’s economy. The post Visitor economy continues to fuel Liverpool, now worth more than £4.5billion appeared first on Prime Centrum. The Southampton City Council Capital Strategy 2018-2022 identifies a housing requirement for the city of 16,300 by 2026 as a priority issue. This is putting increasing pressure on the existing undersupply of housing that reached 940 homes across the region last year. Increasingly recognised as a city of opportunity, Southampton’s economy is thriving and outpacing the rest of the UK, excelling in key industries including professional & financial services and marine & environmental technologies. Renowned as a South Coast financial centre of excellence, home to internationally recognised educational and research facilities and the cruise capital of Northern Europe with its world-class turnaround port – Southampton’s thriving local economy is exacerbating the existing housing shortfall. Nevertheless, the ambitious plans for the city forecast up to 24,000 new jobs over the next 20 years and Southampton’s ambition is matched by a clear vision, plan and ability to deliver. The Council’s determined city centre Master Plan, inclusive of over £3 billion investment in regeneration is playing a pivotal role in the city’s transformation with more major schemes than any time since the post-war years are underway. Very Important Projects’ (VIPs) as set out in the city Master Plan are now underway and under development – including WestQuay South, the new leisure and dining destination, the Station Quarter Redevelopment creating both office and retail space as well as Ocean Village, the £65 million redevelopment of the harbour including the £25 million Southampton Harbour Hotel and Spa shaped like a ship to echo the city’s links with the ocean liner business, a symbol of the prospects for the buoyant city centre. Testament to the council’s commitment to the continued expansion of the region’s economy there also remain plans for a major expansion of Southampton Docks. By 2030, the commercial port is expected to increase exports from 2.7m containers per year to 4.2m. To the west of the existing city centre, plans are also being put together to create a whole new neighbourhood, the Central Business District that will provide for integrated residential, office and leisure uses stretching from the Central Station to the waterfront. This ongoing regeneration will bring further opportunity and investment, boosting the professional population and demand for superior accommodation further. Apartments in the vibrant city centre witnessed a 14% increase in apartment prices over the last 12 months according to Rightmove – an upward trajectory that is continuing as confirmed by Hometrack’s Cities House Price Index that shows 2.3% growth across Southampton in the last 3 months alone. A study by Private Finance also reveals that Southampton saw the biggest rise in yields of any UK city since May 2017, seeing it rise to the from 11th to 4th position of UK buy-to-let hotspots for 2018 – the highest of any Southern city. The thriving economy, unmet housing requirement and strategic investment plan mean the city presents investors with all the fundamentals required to capitalise on maximum returns. The post Southampton City Council Capital Strategy identifies a housing requirement for the city of 16,300 as a priority issue appeared first on Prime Centrum. In spite of several tax changes making it harder to... Read more The post Liverpool heads up the North and Southampton leads the South in the UK’s top 10 rental hotspots for landlords in 2018 appeared first on Prime Centrum. In spite of several tax changes making it harder to make money on buy-to-let, for the discerning investor there are still pockets of the market where investing makes great sense. Buy-to-let specialist Private Finance analysed buy-to-let yields available across major towns and cities in the UK and found that Liverpool is the UK’s best performing property investment location. According to the research, the city enjoys average rental yields of 6.2 per cent once mortgage costs are taken into account. In some areas of London the figure is below 2 per cent. Liverpool has retained its top position since May 2017 and Southampton and Greater Manchester also made the top five buy-to-let hotspots in January 2018, with both destinations offering rental yields of 5.9 per cent. Significantly, London and the South East are absent from the top 10, as high purchase costs have put a severe dampener on yields. Rents in the capital have also been coming down, as renters appear to have maxed out what they can afford to pay each month. The study claimed that some London boroughs offer new investors yields below 2 per cent, due to high house prices that negate any higher rent commanded. The London borough of Haringey offers yields of just 1.4 per cent it claimed, with the average property costing £546,185, while the average rent was £1,493.In Harrow and Hounslow, yields were 1.6 per cent and 1.7 per cent, respectively, while in Lewisham, Watford and Croydon, yields were 1.9 per cent. Investors would need either rents to rise substantially to earn a good return on their money, or house prices to go up. Over the past two years, landlords have been hit by a 3 per cent surcharge in capital gains tax on new buy-to-let purchases, the start of a reduction in the tax relief they can claim against their mortgage costs, and tighter lending standards making mortgages harder to secure. Church said: ‘There are particular challenges for portfolio landlords, classed by the Prudential Regulation Authority as those with four or more buy-to-let properties. Despite the rising cost of being a landlord, across the top 10 hotspots, Private Finance claims rental yields have risen by an average of 0.9 percentage points since May 2017. Southampton saw the biggest rise in yield, of 2.2 percentage points, due to a 20 per cent uplift in rents while house prices in the area rose 6 per cent over the period. According to Private Finance, landlords have benefited from falling mortgage rates, helping to ease pressure on yields. There was a slight increase in average mortgage rates towards the end of 2017 as November brought the first interest rate rise in 10 years but Bank of England data shows that, at 2.47 per cent, the average two-year fixed rate at 75 per cent loan-to-value is at its lowest point since records began in January 2012. The post Liverpool heads up the North and Southampton leads the South in the UK’s top 10 rental hotspots for landlords in 2018 appeared first on Prime Centrum. The first phase of construction of Liverpool’s new Cruise Liner... Read more The post Work starts on cruise terminal allowing Liverpool to welcome the world’s biggest cruise ships appeared first on Prime Centrum. The first phase of construction of Liverpool’s new Cruise Liner Terminal has begun, with the arrival in the River Mersey of an overwater jack-up platform to begin site investigations on the bedrock on which much of the new facility will be built. The platform will be working for approximately four weeks in order to establish the strength of the seabed near to the Princes Jetty. Over the next four weeks, drillers, engineering geologists and support crew will be drilling a total of seven boreholes into the river bedrock, extracting and testing rock samples, to understand the geological layers present beneath the site. Geotechnical engineers are simultaneously drilling a further seven boreholes on land in Princes Parade to carry out ground investigations. The results for both river and land tests will then determine the design of the piled foundations for the terminal, which will contain a suspended deck, and the associated facilities. The investigation works are funded by Liverpool City Council, designed and supervised by AECOM and performed by Fugro GeoServices. McLaughlin & Harvey was confirmed in March as main contractor to deliver the £50m cruise liner terminal project, which is expected to take three years to complete. Replacing the existing facility, it will allow Liverpool to welcome the world’s biggest cruise ships. The project also includes facilities including a 200-bedroom hotel and a 1,700-space car park. Mayor of Liverpool Joe Anderson said:“ Liverpool is used to welcoming majestic vessels to the Mersey, but this unusual looking jack-up platform is arguably our most critical visitor this year given the importance of the work its carrying out. “It is a symbolic moment for the next chapter in the city’s maritime future as these site investigations will determine the foundations upon which our new Cruise Terminal will be built. The first stage of the project will see the council’s appointed design team, led by Ramboll UK, finalise the design and construction method, including completing enabling works such as the controlled dismantling of the existing derelict Princess Jetty, which has been gifted to the city by Peel Land & Property. At this stage, final construction costs will be established, by inviting competitive sub-contract prices for each package of works in advance of the second stage main contract award, whilst designing out construction risks. The main contract works involve the construction on a suspended deck structure and the erection of a vehicular linkspan bridge and pedestrian bridge to connect the new terminal to the existing landing stage. Also included are improvements to the landing stage, including modification of existing buildings such as the lower cruise terminal reception building; relocation of the building on the northern end of the pontoon; and creation of ancillary buildings for storage and use by operational staff. The project also includes improvements to Princes Parade to incorporate pedestrian crossing facilities; the provision of terminal parking, pickup and drop off facilities; and supporting development. Currently, cruises are worth more than £7m a year to the local economy, and 2018 will see Liverpool welcome around 60 vessels, with 100,000 passengers and crew. An outline planning application for the new facility was approved by the council’s planning committee in April. Full site preparation is expected to start in October 2018. The council is also in the process of promoting a Harbour Revision Order through the Harbour Authority to remove the existing jetty and construct the new terminal. The professional team also includes architect Stride Treglown, cost manager Gardiner & Theobald, planner JLL, and landscape architect Hyland Edgar Driver. The post Work starts on cruise terminal allowing Liverpool to welcome the world’s biggest cruise ships appeared first on Prime Centrum. Liverpool plans office boom as supply dries up. A report... Read more The post Plans are being drawn-up for a massive expansion of Liverpool’s business district. appeared first on Prime Centrum. Liverpool plans office boom as supply dries up. A report to city council’s cabinet on Friday will recommend a Spatial Regeneration Framework (SRF) be drafted seeking to develop the district and potentially connect it to the development of Princes Dock in the £5.5bn Liverpool Waters scheme. The brief, brought forward by the council in partnership with the Liverpool City Region and Professional Liverpool, will be put out to the market early next month and a team is expected to be in place by July. The business district, which covers 40 acres at the northern fringe of the city centre, predominantly consists of offices. It saw office take-up up rise by 16% in 2016 but vacant office stock continues to fall and now stands at just 958,083 sq ft with only 330,438 sq ft ready to occupy. Based on current projections there will be no grade A office space available in the city centre by the end of the year. To address the shortage the city council is seeking to support a £200m plan to develop a scheme in Pall Mall, with Kier Property, that will provide 400,000 sq ft of new Grade A office space. The council is also investing £100m in new road infrastructure at the northern fringe of the district and has recently submitted a planning application to create a new cruise terminal at Princes Dock. Mayor of Liverpool Joe Anderson said: “Liverpool’s business district is a major engine in the city’s economy and its future growth needs to be proactively managed to maximise its potential and further underpin the development of Liverpool Waters. Steve Stuart, Chair of the Professional & Business Services Board for Liverpool City Region, said: “There is a shared concern between public and private sector about the commercial office market in Liverpool in terms of low rentals and availability of high quality Grade A and Grade B space. Following cabinet approval a brief will be put to the market in the summer with consultation to follow in the autumn, before a final SRF is submitted in early 2019. The city council has recently followed a similar process to masterplan for the Ten Streets Creativity District, Knowledge Quarter Gateway and Baltic Triangle. The post Plans are being drawn-up for a massive expansion of Liverpool’s business district. appeared first on Prime Centrum. UK city house price inflation was 5.2% in the 12 months to February 2018 compared to 4.0% a year ago. The divergence in house price growth between southern England and regional cities continues with overall HPI at 5.2%. London growth remains slow at +1%, and the greatest downward pressure on prices is being registered in inner London with prices falling across 42% of London postcodes. Fig.2 shows the proportion of London city postcodes registering positive and negative growth since 1996. The current coverage of markets registering negative growth is the highest since the global financial crisis. There have been other periods when parts of London have registered falling prices and these are explained by economic and other external factors. The coverage of postcodes with negative growth has risen sharply since 2015. This is a result of tax changes impacting overseas and domestic investors and stretched affordability levels for owner occupiers that have been compounded by Brexit uncertainty. Sales volumes are first to be hit when demand weakens and housing turnover across London is down 17% since 2014. Prices are next to follow but the scale of current price falls remains modest. Most markets registering negative growth are experiencing annual price falls of between 0% and -5%. We expect the number of local markets with falling house prices to grow further in the coming months as buyers accept lower prices to achieve sales. The net result will be a negative rate of headline price growth for London by the middle of 2018. The greatest downward pressure on prices is being registered in inner London areas where prices are highest prices, yields lowest and with a greater share of discretionary buyers. The post Liverpool top tier 1 city for Capital Growth at 7.8% appeared first on Prime Centrum. If you are the owner of Prime Centrum Property Investment, or someone who enjoys this blog why not upgrade it to a Featured Listing or Permanent Listing?